We live on a cattle property called Castle Creek, it is 3/4 of an hour from Theodore and 1 hour from Banana in Queensland Australia! 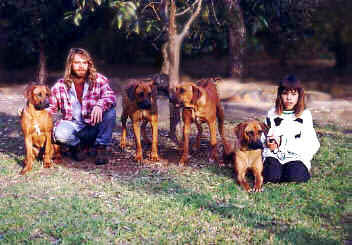 We are only relatively new to this wonderful breed called the Rhodesian Ridgeback and at the moment we can’t see ourselves ever wanting to have another breed. 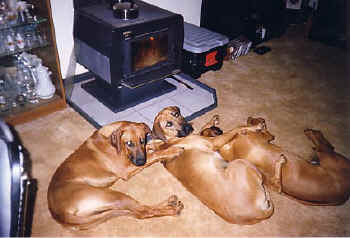 When we bought our first Rhodesian Ridgeback Bernie we decided that since we had a purebred dog we would show it. We went to an RR Club of Qld Show but left Bernie in the car at first, worried that she wouldn’t look like the other dogs. We needn’t have worried. We were welcomed into the show world and with the help and friendship offered we quickly realised we wanted more and arranged the purchase of a boy of our own (Doulen). Bernie’s first litter produced our first homebred Champion (Ch Riginal Gold Dust Woman ET ROM) and Riginal was well and truly on its way. Our second litter (Doulen over Bernie) gave us our next Champion (Ch Riginal Mustangsally ET) and was so successful that we have repeated the mating another two times. Our latest exciting adventure has been importing (in partnership with Shane & Kerrie Lambley and Wendy Lam) a lovely young boy from one of Sweden’s top breeders, Veronica Thoren of Rex Ventors Kennels, his name is Ruger aka Aust Gr/Neut Rex Ventors Rare Edition ET Imp Swd. With excellent breeding, structure & temperament we are very excited to have him here! Ruger is now almost 10 yrs of age and has had a very big impact on the breed in Australia and more to come! and Doulen a long time ago.